Karen thought her list was an easy one this month. Simple items referring to winter and the month of February. In some ways, she was right. In others, I had to get a bit creative. Photos taken with an Apple iPhone 4 using the Pro HDR app, except where noted. You would think considering the time of year and where I live, this would have been an easy one. Any other year, it would have been. This year I returned to a favorite breakfast cereal from my youth. 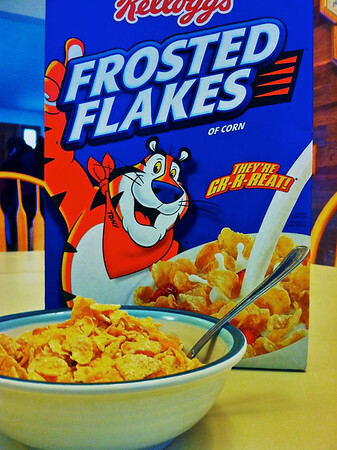 Hey, they’re gr-r-reat! 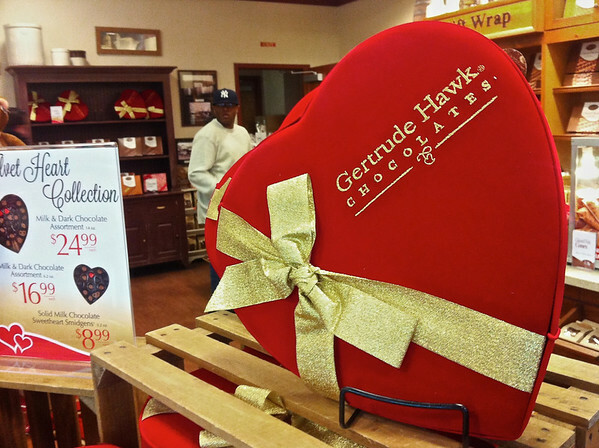 With stores filled with Valentine’s Day merchandise, finding a bow was easy. Finding one worthy of Karen’s photo hunt took a little more time until I walked into the Gertrude Hawk shop. A golden bow on a deep red heart shaped box. Perfect! When participating in Karen’s photo hunts, I put the list on my iPhone so I can refer to it wherever I happen to be. 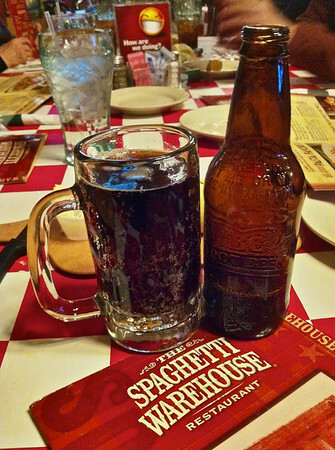 When attending a family celebration at the local Spaghetti Warehouse restaurant I ordered one of my favorite sodas, a bottle of IBC Root Beer poured into a large glass mug. This one I knew what I was going to photograph. I walked out to my company’s warehouse and looked for a pallet of soda. 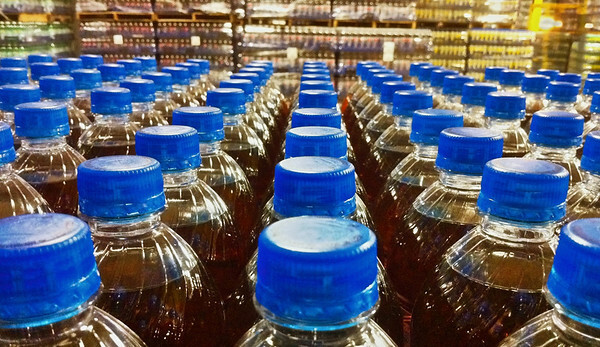 It turned out to be a pallet of Lipton tea and I lined up this photo of the blue caps in rows. Years ago my local malls were filled with Cindy Cinnamon Rolls locations. They were huge buns with billions of calories and people did not care they were so good. 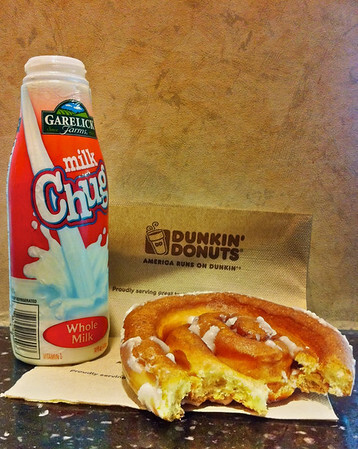 Alas, I could only find this coffee bun at Dunkin’ Donuts. Tasted okay but I do miss Cindy’s. This was not taken with my iPhone nor this month. I still wanted to include it as I have shared it previously online but not on this blog. Waterfall flowing into a heart shaped pool looking down from the Gorge Trail in Watkins Glen State Park, Watkins Glen, New York. Nikon D700/28-300VR, 1/20s, f/16, ISO 6400, EV 0, 28mm focal length. This entry was posted in Assignments and tagged app, apple, blue, bottle, bow, box, bun, caps, cereal, chocolate, dunkin' donuts, flake, glass, gorge, heart, ibc, iphone 4, lipton tea, milk, mug, new york, plastic, pro HDR, restaurant, root beer, row, spaghetti warehouse, syracuse, water, waterfall, watkins glen. Bookmark the permalink. These are all fantastic choices (and wonderful photographs!) Nice! Watkins Glen State Park is incredible. I think I need to get back there this year. They’re all great shots but I am especially impressed with the rows of blue caps. The blue and brown look so good together. 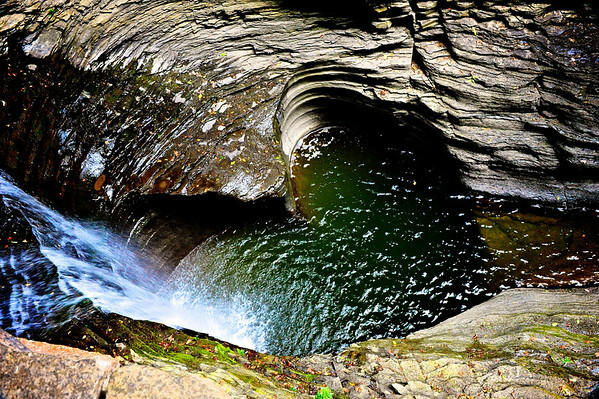 The heart-shaped waterfall pool isn’t in-your-face obvious, which is probably what makes it so beautiful. Ha ha, Frosted Flake(s)! Funny… Fun to see what you came up with. I am so in love with rows of tea, you can’t imagine. It is the BEST! Great photos…but that heart shaped pool? Priceless.